Straddle cranes are highly versatile machines that can be used for a wide variety of applications and terminal operating modes. They can move cargo vertically and horizontally, stack containers in stacking areas and load them off/on-road vehicles.With almost twenty decade years’ dedication in this straddle carrier lifts manufacturing industry, Ellsen Crane Machinery bring new designs and innovative technologies for this crane to enhance the working performance of our customer’s industry. Customized standard heights: perfectly match for your individual usage for your industry, including two types, three containers high and for containers high. Two-way operation styles: straddle operation ways are perfectly meet your straddle carriers’ operators’ operation habits which include single operation and double lift operation. Leading design features: pioneering in the same industry, enhance your industry working efficiency to a large degree, the innovative design feature of individual hydraulic units at ground level results in a more dynamic response of the steering and braking system. 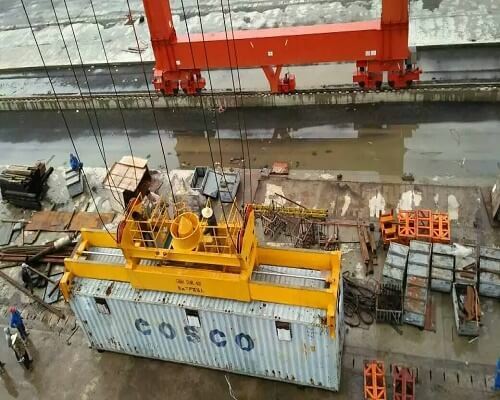 Energy saving: powered by eco-efficient diesel engines, the straddle carriers manufactured by Ellsen crane machinery, in alliance with the latest applicable emissions regulations in the country. Both hydraulic- diesel and diesel-electric drives can be applied in the crane. So you have a wide range of options, which are high performance and energy saving. 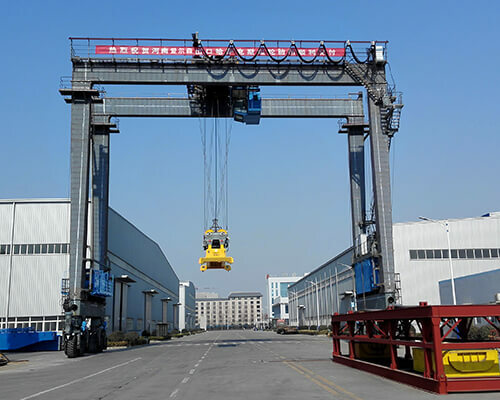 Whatever kind of straddle travel lifts you choose from our crane factory, the Ellsen crane manufacturer have the right one for your terminal, meeting your operational requirements and local environmental regulations. How many things do you know a straddle crane? What is the straddle carrier used for? The straddle cranes are road-going vehicles that could easily transport lumber around mills and yards. Lumber was stacked on special pallets known as carrier blocks; the carrier would then straddle the stack, grasp and lift the carrier block, and drive off with the load. Because a straddle carrier is open at both front and rear, it can transport lumber much longer than the carrier itself, over 30 m (100 ft) in length. Perfect adjustability: easy to operate and can be widely applied in most of the conditions needed container material handling applications. Highly configuration: top configuration of the crane enable the machine work in a high speed and stable operation which will save your time in the material handling process. Wholistic machine: the straddle carrier can be operated independently and has no need in yard infrastructure supports which can save your investment costs largely. Customized sizes: choose what you like, these crane lifts are available in different sizes, stacking containers 1-over-2 or 1-over-3, ideally suited for step-by-step enlargement of container terminals as required. Auto operation: they are also now available as automated versions with higher security and working performance which can save your crane operator costs.Online service network: any need for the straddle cranes design, project solution, operator training, installation, maintenance, guides, etc you will immediately get help from our crane engineers’ help online. Extensive training both on-site and in our facility for operators and engineers. Purpose built state-of-the-art design and production facilities. Highly skilled and experienced staffs with expertise in-house for after-sales service. High responsibility: if you have any problems in interface and compatibility, such as the structural and electrical design, production, commissioning and service, all of them Ellsen can be your useful assistant. Cost-effective and flexible solution: the straddle cranes lifts are more cost-effective and flexible solution for distribution, shipping, and haulage companies even with relatively low throughput levels. The more economical option provided: Ellsen crane engineers will provide much more economical option solutions for your reference in alliance with your working requirements. Ellsen straddle lits is more cost-effective than heavy handling forklifts, reach stackers or mobile cranes and offers complete independence when moving very large fully laden containers and other oversized loads around sites. 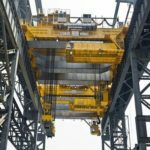 Highly recognized by our clients: Ellsen straddles port lifts are trusted by terminal operators around the world for their ability to enable faster ship-to-shore crane operations and more efficient landside operations. Efficiencies promotion: Ellsen Straddle Carrier assists the end user to improve their efficiencies on site by reducing reliance on a transport company and therefore improving the productivity of yard operations. The container crane in this environment allows a company to independently move containers while empty or full without a transport company’s assistance. This allows for the separation of warehousing operations and transport operations ensuring the continued and extremely efficient flow of production. Small cranes for your yards and depot. Straddle cranes supplied by Ellsen crane company can be widely applied in different kind of working conditions. In your yard or depot, the factory has small straddle cranes carriers, which is usually large but smaller versions to move containers. Thus, if you need produce a product for your clients and must load it into a container into for delivery, we recommend our cost-effective mini container straddle cranes for your reference. Straddle harbor lifts for your harbor and ports. In port terminals, you may need a travel lift to work within smaller spaces to improve efficiencies and decrease reliance on the transport companies, Ellsen port straddle lifts can help you out in such circumstance. Ellsen portal straddle carriers are specifically designed for your ports and harbor. Industrial straddle carriers for your manufacturing and construction industry. Ellsen straddle carriers for industrial application are designed for your construction and manufacturing industry for handling oversized loads such as steel and pre-cast concrete and where transportation of special loads such as nitrogen tanks is required in restricted spaces not suitable for trucks. A key advantage of industrial straddle carriers over forklifts is the ability to load or unload a semi-trailer in a single operation, which can improve efficiency. 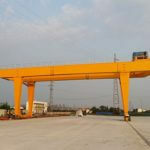 Common modern application for straddle crane: the most common modern application for straddle carriers is in port terminals and intermodal yards where they are used for stacking and moving ISO standard containers. Straddles pick and carry containers while straddling their load and connecting to the top lifting points via a container spreader. These machines have the ability to stack containers up to 4 high. These are capable of relatively low speeds (up to 30 km/h or 18.6 mph) with a laden container. The workers that use this machinery sit at the very top seated facing the middle as they can see behind them and in front of them. Straddle carriers can lift up to 60 t (59 long tons; 66 short tons) which equals up to 2 full containers. Associated with Ellsen straddle carriers in the industrial fields above or any application fields you need straddle lifts, you will embrace a high promotion efficiency in your industry. 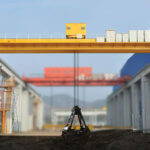 Any types of straddle cranes you need, Ellsen crane machinery have in store. Ellsen carriers mainly include industrial straddle carriers, shipping container carriers applied in different kind of working conditions. There are also different kinds of straddle carriers with different capacities, from 2t to 600t are all available for your choice. The third types of straddle crane is the high performance crane which include three types, the fast charge straddle container crane, a flexible and cost-efficient, environmental-friendly, fast charging container handling equipment, the auto straddle crane, an ideal solution for medium-sized and large terminals where high equipment flexibility, safety, and minimal labour costs are key requirements. It is our proven solution for automating your quay, stack and landside operations. It is ideal for medium-sized and large terminals where high equipment flexibility, safety, and minimal labor costs are key requirements. Automated straddle carriers increase terminal safety and sustainability, and provide greater long-term value than manual solutions.The flexibility of the Ellsen straddle crane makes realizing an automated terminal simple, low-risk and achievable within a relatively short timeframe. Ellsen straddles hybrid carrier is configured with advanced technology which is also an energy-saving crane suitable for your industry. Its sustainable performance that takes your operations to new heights. With hybrid motor technology, the hybrid carrier is very economical in energy consuming. With this configuration, the crane can save 60% fuels than a traditional diesel-electric machine. The maintenance-free regenerative energy system and robust frame enable the crane work in a high performance and environmental-friendly way. Ellsen small straddle carriers is a king light duty and low-cost crane for terminal users. 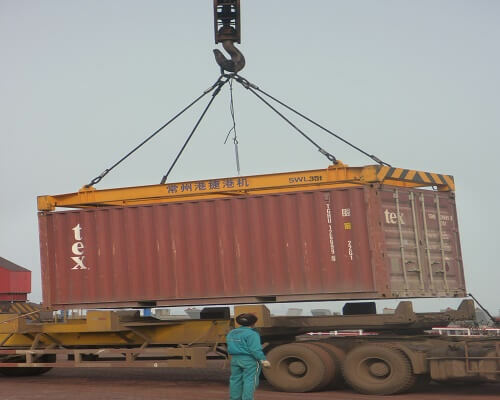 This kind of cranes originally have two towers; the rear tower lifts the rear of the container, while the front tower lifts the front of the container. 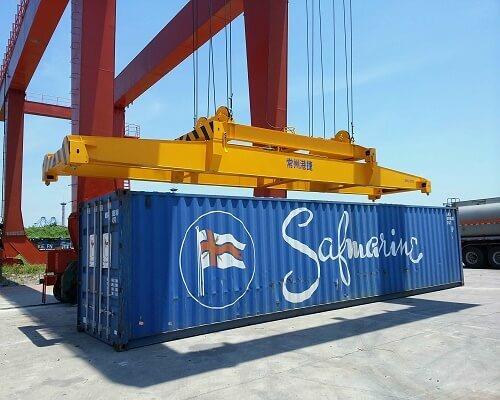 Equipped with this kind of mini straddle carriers, you can handle your containers inside low buildings, which is a special feature of the small cranes have. This kind of cranes also has anti-swing features as its arms lock into the bottom corner castings. All kinds of Ellsen straddle carrier models can be automated in a cost-effective way. The crane engineer teams in our factory can future-proof straddle carriers during manufacture by configuring the machines for manual or fully automated operation, giving you the freedom to move towards automation at your own pace. Horizontal transport and stacking design save your cost in other machines for container handling. Unique and extremely safe, the crane can be operated inside your yards freely. 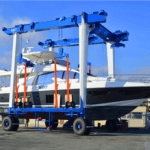 How much will you cost in a straddle crane for your marine industry? The straddle crane price from Ellsen machinery is lower than other companies in the same industry, since it has its own factories, and all types of straddle cranes are manufactured by our crane. There are no third partners in the crane purchasing process. No matter in the entire crane price or the crane parts, the company will offer you the factory price and sometimes there are also special offers for some kind of our crane products. So choosing Ellsen to straddle crane you will save your cost to a large degree. Influenced by the currency rates and crane manufacturing costs, sometimes our crane prices will make some changes if you want to get specific and latest of our straddle carriers’ price lists, welcome to contact us. Ellsen straddle crane has been applied in our Chile clients for container handling in their railroad construction projects in November 2017. 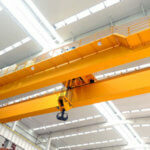 The entire crane purchasing and delivering and installation process are very successful. It takes less than one month, the company finished this project from crane purchasing solution, design, engineer assistance, installation service. Thus, if you need a straddle carrier for your industry, we can provide you the one-stop service for crane manufacturing, design, delivering, and installation. Kindly cutting your cost in the whole project both in time and investment. In Ellsen, we provide you standard and non-standard straddle carriers for your convenience. If the standard straddle crane cannot meet your requirement, we can provide our customized service to support your project. The customize straddle crane service include in weight, painting, system selection, crane operator training, etc. Any needs, there are Ellsen crane engineers and staffs to answer any questions related to the straddle carrier.